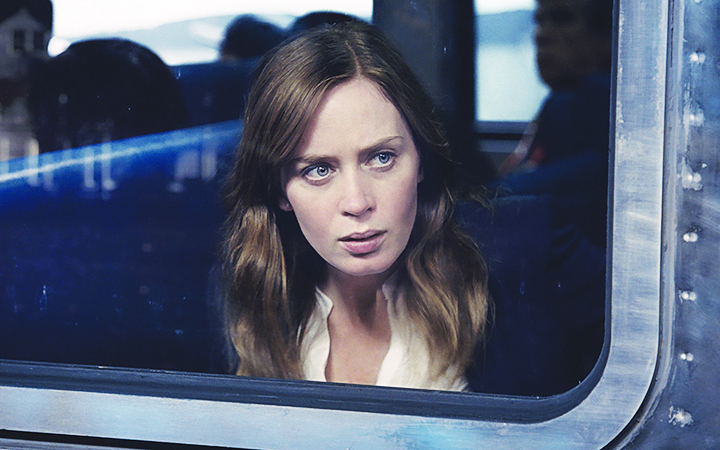 “My husband used to tell me I have an overactive imagination,” says Rachel (Emily Blunt), watching the scenes of New York’s Hudson Valley go by as she stares out the window of the train she takes on her daily commute into the city. Those scenes, that train and that “girl”—Rachel—drive the drama in the highly anticipated big-screen adaptation of British author Paula Hawkins’ 2015 thriller, which has sold some 11 million copies worldwide. After her divorce, Rachel spiraled even deeper into her alcohol-soaked resentment—and it tortures her every day when the train passes her old house, now occupied by her former husband, Tom (Justin Theroux), his new wife and former mistress, Anna (Rebecca Ferguson), and their new baby daughter. The young woman’s name is Megan, and she works as Anna and Tom’s nanny—and loathes it. As Rachel’s bitterness about Tom and Anna grows, her voyeuristic beguilement with Megan intensifies when she sees her in the embrace of another man, triggering Rachel’s memories of her own husband’s unfaithfulness. One evening Rachel goes on a drunken tirade about Anna the “whore,” takes the train to her neighborhood, but then blacks out—and wakes up the next morning covered in mud and blood. And Megan has disappeared—or worse. When Allison Janney steps in as a homicide detective, it becomes a murder case. (Did the screen suddenly pick up a stream of CSI: Westchester County or something?) Did Rachel do it? She honestly doesn’t remember. And as blurry as her memory is, she wants to find out the truth, as twisted as it might turn out to be. Tate Taylor—who also directed The Help (2011), another drama with a powerful female ensemble—builds the mystery by toggling between Rachel, Megan and Anna and each of their stories, going backward and forward in time to pick up pieces of the fractured, fragmented puzzle. The performances are all super-solid, especially from the three women playing the triad of females in various states of personal misery and psychological abuse; as the movie takes us deeper into their stories, we see how they all connect, interweave and eventually collide. It’s about secrets, lies, loneliness, love, infidelity, rage, motherhood, things that aren’t always as they seem, and layers and layers of buried hurt and loss that finally come frothing to the surface, spilling into the light. The shocking conclusion splashes out dark, red and juicy—a catharsis that taps a wellspring of pent-up emotions. Emily Blunt is an extremely versatile actress who’s done musicals (Into the Woods), comedy (The Devil Wears Prada), sci-fi (Edge of Tomorrow, Looper), family flicks (The Muppets), fairy-tale fantasy (The Huntsman: Winter’s War) and action (Sicaro). Now she’s landed a role that will get her even more serious mainstream attention. For her, especially, this Train is just the ticket.